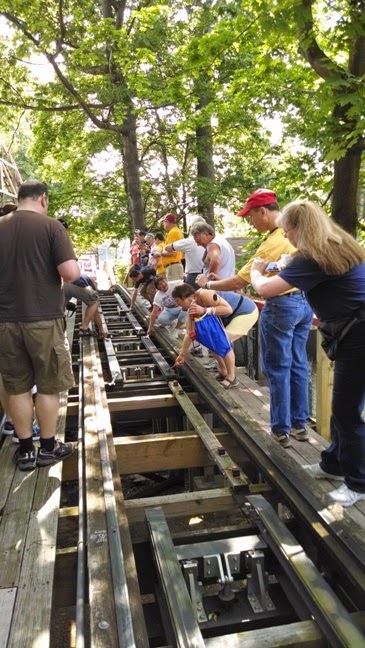 On Saturday June 28th, Waldameer and Water World was host to a lively group of roller coaster enthusiasts from the Great Ohio Coaster Club (GOCC). 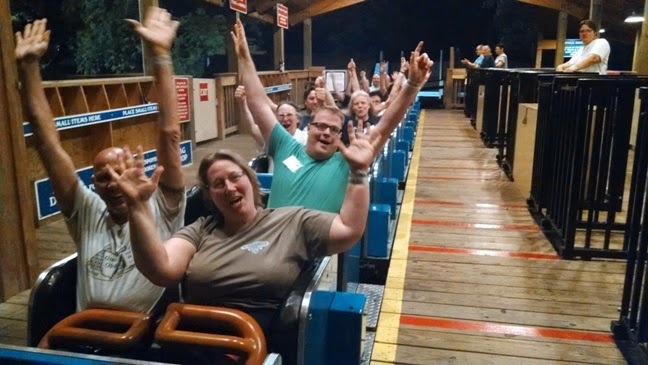 As a part of their Spring Fling weekend adventure, members of GOCC were treated to exclusive behind the scenes tours, delicious catered meals, and of course a huge dosage of exclusive ride time on two Waldameer favorites, Comet and Ravine Flyer II. 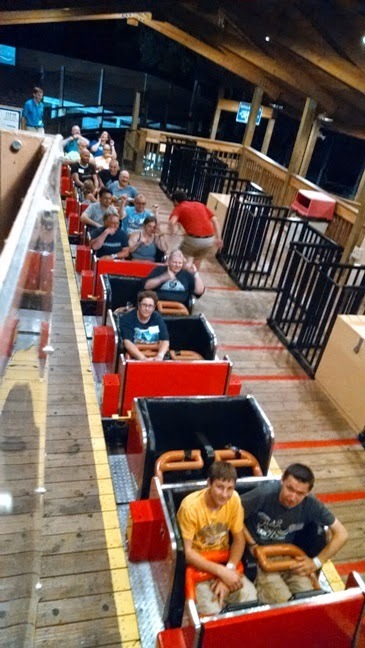 A group photo at the base of Comet's lift hill. After some coffee and donuts, the GOCC visitors were fueled and ready for a day of exploration and coaster riding. They started with a walk-back of Comet where they got the chance to explore and take rare pictures of the classic coaster. One of Waldameer's maintenance team members, Steve Roward, even set up a demonstration showing off the power of Comet's recently installed, one-of-a-kind magnetic braking system. From infield, to lift house, to brake run, not an inch of Comet went unexplored. GOCC members attempt to pry wrenches free from the incredible grip of Comet's magnetic brakes. Once the exploring of every inch of Comet was complete, it was time for some exclusive ride time (ERT) on this longtime Waldameer favorite. While Comet is by no means the biggest or the most intense roller coaster out there, there is no doubt that a ride on this classic can sure put a huge smile on anyone's face. But Comet ERT in the morning was only the warm-up for what was in store for the evening. Goodnight Sweetheart might have signaled the end of another busy Waldameer Saturday for most guests, but for GOCC the song was the kickoff of some epic nighttime ERT on Ravine Flyer II and Comet. Ravine Flyer II's red train prepares for yet another run during nighttime ERT. Blue Train roars back into the station after an intense, "extra dark" night flight. Thank You Great Ohio Coaster Club for including Waldameer and Water World in your Spring Fling event. We certainly enjoyed your excitement and passion for all of our rides and attractions. We can't wait for your next visit! Perry showing off is plaque in front of an interesting collection of photographs. Construction Manager and Mechanic, Perry Duncan, thought we was being called upon to fix gas valve in Rainbow Gardens last Thursday. Grabbing his handy tools, Perry got right onto the call for assistance. Little did he know, there was a burst, but not one from a faulty gas valve. Instead, a burst of joy and laughter as the Waldameer Family put on a surprise party for Perry. Family, friends, and coworkers were all gathered to celebrate Perry's decades of dedication and passion for Waldameer and Water World. Food, cake, an inspiring speech from Mr. Nelson, and a plaque to honor his service were all in order for a fun-filled, celebratory afternoon. Perry and his Wife (right) and Granddaughter (left). 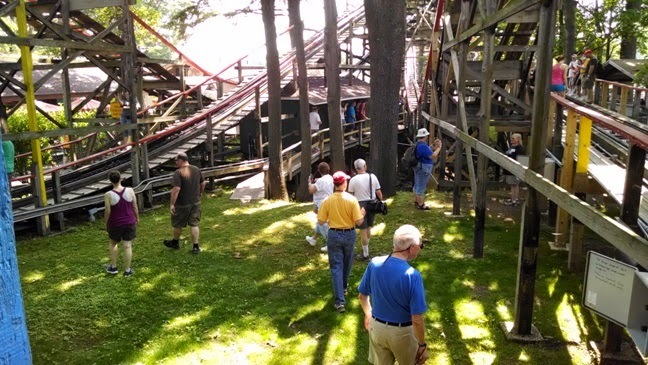 The Duncan family is deeply rooted into Waldameer's history with Perry's Mother and Father living on park property and working within the park for several years. 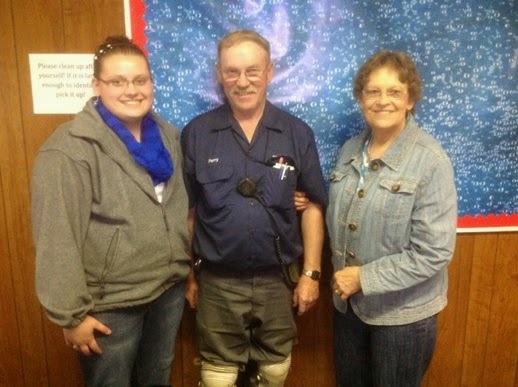 Today, Perry and his granddaughter keep the family tradition alive with their ongoing service to Waldameer. Perry has been well-known for his years of diligent care of Waldameer's award-winning darkrides, Whacky Shack and Pirate's Cove. In addition, Perry has serviced and maintained a variety of other Waldameer attractions such as the reliable L. Ruth Express, the dizzying Tilt-A-Whirl, and the kiddie Wet Boats among many others. Perry takes pride in his ever-growing collection of toys and figurines that welcome riders into Whacky Shack. 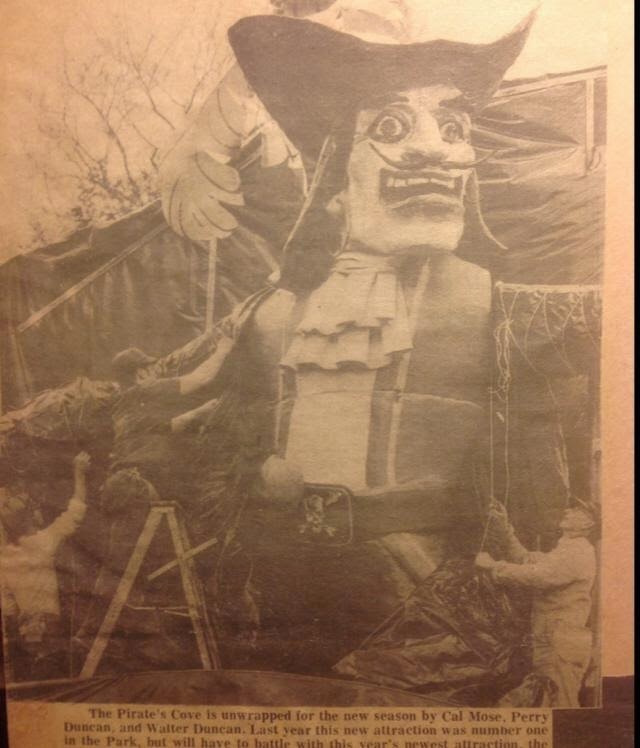 Perry and his Father unwrapping the iconic Pirate on top of Pirate's Cove in preparation for another season in 1973. Being always the first to arrive at 5:45am and often one of the last to leave after "Goodnight Sweetheart" signals the end of a grueling Waldameer Day, Perry Duncan's years of dedication cannot be appreciated enough. Thank You Perry!